Happy Summer! As I write to you from MASS MoCA, I find myself in the midst of a nearly month-long bout of zig-zagging across the country and eventually over the big pond for various and sundry performances, workshops, and rehearsals – mostly beset by hot and humid weather with a sprinkling of summer showers. I’m seated on the mezzanine of a rehearsal room at the museum, watching as Bang On A Can’s illustrious Mark Stewart hands out reeds to an eager group of workshop participants to attach to PVC pipes, plastic tubes, and whirlies of all shapes, sizes, and curvatures. The room is slowly beginning to fill with joyful honking and bleeting, and Mark attempts to corral them into a unison phrase in 7/8 time. They follow his lead and a mirthful squawk chorus ensues. I started this journey with a visit to Detroit, MI, where I gave a solo performance as part of an event called “Rejecting Reality” at Red Bull Arts, organized and curated by the percussionist Zac Brunell and produced by a guy called Robert-David Jones (who bears an uncanny resemblance to Childish Gambino) as part of Detroit Art Week. The event opened with a “robot gamelan” created by the Detroit Bureau of Sound, followed by Zac’s set featuring grains of salt dancing in patterns on metal plates attached to speakers. 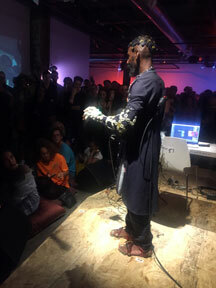 Then there was a solo performance by Onyx Ashanti (who I had recently met at the NIME conference in June) manipulating sound with his 3D-printed prosthetics, and the event closed with my voice, electronics, and video performance. 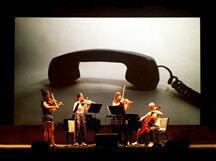 From there, I headed to MASS MoCA (via New York) for the Bang on a Can Summer Music Festival, to work with the string quartet that will be performing my piece Attention on the upcoming Bang On A Can Marathon. I’m so delighted that the inimitable Ashley Bathgate will be leading the ensemble and playing cello on my piece. I had the opportunity to be present for the tech rehearsal and soundcheck, and the quartet is performing the work beautifully. 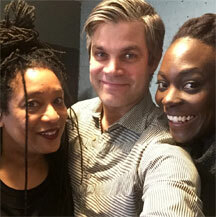 I’ve had a wonderful time at “Banglewood"! I even managed to squeeze in a quick viewing of some of the incredible work in the massive MASS MoCA galleries – including a retrospective of Sol LeWitt wall drawings, some glowing James Turrell works, and a magical VR installation by Laurie Anderson. So many new music gatherings! Since the last issue of the Gazzetta, I’ve attended and performed in a number of new music festivals and conferences, where I was also privileged to see and hear lots of exciting work. whose text-sound work A Pause was reminiscent of Mark Applebaum’s gesture composition Aphasia. Then there was Other Minds in San Francisco, which focused entirely on text sound poetry, and featured the master himself, Jaap Blonk. I was happy to also see Charles Amirkhanian reprise some of his early works with projected images by Carol Law. After that, New Music Gathering at the Boston Conservatory was full of new music joy, in spite of the sadness everyone was feeling about the untimely passing of Matthew Marks. And close on the heels of that came the aforementioned NIME (New Interfaces for Musical Expression) Conference at Virginia Tech, where I gave a solo concert and a keynote speech. Try, if you will, to imagine an entire conference populated with the type of music nerds who, like me, revel in the use of all manner of gesture controllers and newly invented musical instruments. Attendees and presenters came from all over the world and put on a week’s worth of fascinating concerts, talks, and workshops. 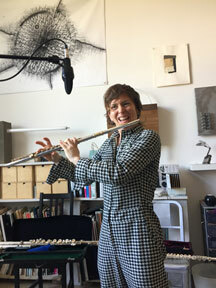 Before departing for this current trip, I had a studio visit from Claire Chase, who brought all of her flutes with her so I could record some of her intriguing techniques to aid with my work on the piece she’s commissioning me to compose as part of her "Density 2036" project. When I return from Berlin, I really need to hunker down and begin working on that and all the other projects I have queued up. For some reason, when it rains in chamber music commissioning-land, it really pours. I have about five different composing commissions from various ensembles (including Eighth Blackbird), soloists, and choreographers, that all have deadlines right around the same time. So, for the balance of the summer, the fall, and the beginning of winter, I’ll be nose to the grindstone cranking out adventurous chamber works one after the other! See you all later – whenever I can come up for air! Mark Stewart conducts an ensemble playing original instruments. Onyx Ashanti at Red Bull Arts in Detroit. Photos: Pamela Z, Daniel Nichols Media, Ebbe Roe Yovino-Smith, Robbie Sweeny,Dominic Johnson, and Allan J. Cronin. 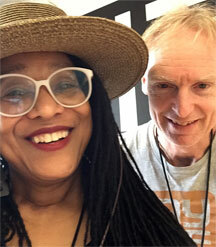 Pamela Z’s Attention, for string quartet and fixed media, will be performed on the Bang On A Can Marathon as part of the BOAC SummerMusic Festival at MASS MoCA Massachusetts Museum of Contemporary Art in North Adams, MA USA. Originally commissioned and premiered by Del Sol Quartet in 2016, Attention will be performed by a quartet consisting of three Bang on a Can Summer Music Program Fellows– Rose Kow(violin) Stephani Liu (violin) and Molly Collier-O'Boyle (viola), with BOAC All Stars' Ashley Bathgate (cello). 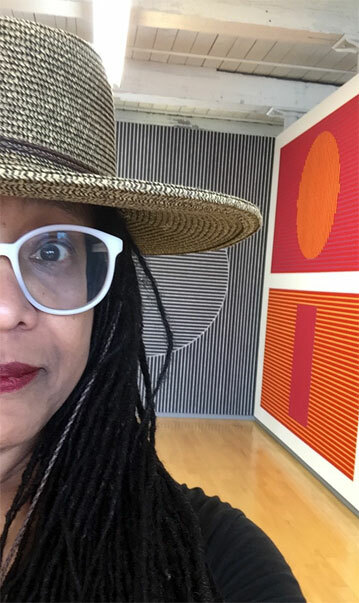 Pamela Z will give a solo performance in a shared concert and participate in a panel discussion as part of the Magnetic Fields: Expanding American Abstraction exhibition at The St. Petersburg Museum of Fine Arts at 2pm-7pm in Saint Petersburg, FL USA. Pamela Z will perform solo work for voice and electronics on a shared concert as part of the (R)evolution: Resonant Bodies at Banff Centre for the Arts and Creativity at 7:30pm in Banff, AB Canada. Dock 11 Berlin presents ECHO by Sara Shelton Mann as part of the Once in California Festival at 7pm in Berlin, Germany. Pamela Z composed the music for this new dance/performance work by choreographer/writer Sara Shelton Mann. The piece will be performed by Anya Cloud and Jesse Zaritt, with composer Pamela Z performing portions of the score live. 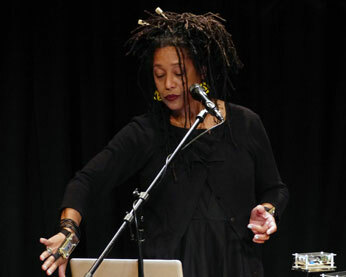 She will perform a set of her own solo voice and electronics works, as well as a song composed by Meredith Monk on an evening that will also feature Sarah Maria Sun and Gelsey Bell. Pamela Z will give a concert of works for voice, electronics and video at Illinois Wesleyan University in Bloomington, IL USA. Pamela Z composed the music for Echo, a new dance/performance work by choreographer/writer Sara Shelton Mann. The piece will be performed by Anya Cloud and Jesse Zaritt, with the composer performing portions of the score live.